My first contact with yacht designer and author Steve Dashew came after he wrote an article entitled Drag Device Polemics in the May 2000 issue of Blue Water Sailing. He condluded that the parachute sea anchor system "can work in gale and moderate storm conditions, but may not be suitable for use in huge breaking seas and winds of severs storm strength." As a drag device designer for parachute sea anchors, I disagreed with him and submitted a response to his article that essentially provided a basic outline of the “Constant Rode Tension Theory” that I developed from experience gained during sea trials while designing the “Buckle” and “Para-Ring” parachutes with Fiorentino’s Research Team. This theory states that “Keeping the rode taut is the key to successful parachute anchor and storm drogue use.” Maintaining taut rode often requires changing rode lengths, adding weights next to the para-anchor and balancing the boat with bridles sail and/or through rudder position. I concluded by saying that constant rode tension allows bow deployed para-anchors to be used effectively in extreme weather. W.A. Coppins—a minimum of 32.9-feet (10 m). According to industrystandards, a boat like Steve’s would require a para-anchor approximately two sizes larger than Fiorentino’s recommendation. Many of Fiorentino’s online instruction videos demonstrate how maintaining “constant force” in the system is the “big secret” in maximizing the performance of a drag device, thus permitting the use of a smaller para-anchor. Fiorentino’s original formulas, as shown in the video, demonstrate how to pay out specific lengths of rode and/or to connect a small piece of chain next to the para-anchor to minimize stretch in the setup. If you minimize stretch, then force generated from the para-anchor reaches the bow of a boat faster to help maintain the bow head to wind or in a hove-to position. Without “constant rode tension,” rode becomes slack far too long and the boat tends to bounce around back and forth uncomfortably. This was the first time Steve had ever deployed a drag device so his desire to test several of them was very encouraging. Since engineering is second nature to him, he quickly figured out the basics of how both the para-anchor and storm drogues worked. We decided to follow the test parameters established from my previous sea trials conducted with Fiorentino and other government organizations. 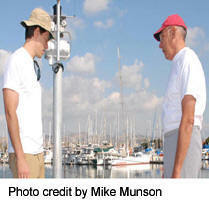 We first practiced deploying the 24-foot (7.32m) Fiorentino para-anchor from the Wind Horse. 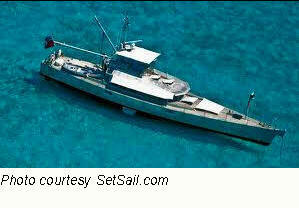 Later, we conducted tow tests with a Galerider, a Jordan Series drogue (stopping drogue) and a Fiorentino Shark drogue. Steve’s wife, Linda, helped us out by taking the helm. Two reporters, Beth Leonard and Evans Starzinger were invited onboard to observe the test. Professional photographer Michael Munson, hired by Fiorentino, photographed our efforts. Beth Leonard also contributed photos. When we laid out the Fiorentino Para-Anchor on the deck of the Wind Horse, Steve brought out a bag of Spectra anchor rode, telling me he thought lighter rode would be better for para-anchor use because it was lighter and easier to handle. Although this is not my preferred choice for rode, I do appreciate Spectra for its ease of handling and low stretch characteristics. The Para-Anchor deployment and retrieval went off without a hitch. Steve noted in his log posting a few days later on setsail.com that, “Fiorentino makes what looks to our eye a very robust, well-thought out piece of gear.” Of course, Steve hopes to never have to use it! Nylon is currently the industry’s established standard for rode used in drag device deployment, but it can stretch easily creating significant slack in the rode. Long periods of rode slack can cause the drag device to lose its grip allowing a boat to fall sideways to the waves. As the drag device re-inflates the rode becomes taut very quickly which generates a high rate of force that can easily break equipment. Fiorentino’s sea trials have been most successful in reducing shock loads caused by oscillating rode when we use a braided rode that has an outer Dacron cover to reduce rope stretch and chafe, but an inner nylon core to absorb shock loads. This is the same mix that Fiorentino uses exclusively in its rode manufacturing process. Research completed by our team shows that the mixed rode is stronger than rode that is all Dacron or all nylon, because the combined fibers work together more efficiently to keep the rode taut. The mixed rode is heavier to use, but it does give sailors the option of omitting the use of chain weight attached to the para-anchor. Regardless of the fiber-type you choose for deployment rode, I recommend sticking with braided rode since it has less stretch and is easier to pack than stranded rope. If you choose to use stranded rode then we highly recommend that you connect at least 6-feet (1.83 m) of chain to the para-anchor to maintain constant force upon the rode. Chain diameter should equal the deployment rode’s tensile strength. Fiorentino’s sea trials demonstrate that lightweight rode like Spectra can be made more effective, by adding weight next to the para-anchor or storm drogue to maintain “constant rode tension.” (View Tech report FPA-124 and the Shark Manual for research results on this subject). Weight added next to a para-anchor contradicts the industry standard of attaching weight at the boat end instead of the anchor end, but Fiorentino’s reports show that it’s a more effective way of keeping constant tension on the rode. Today, I think Steve still believes that moving the boat is probably the best policy for storm tactics, but he’s decided to cover different scenarios such as “What if the boat breaks down or what if actively steering the boat fails?” Steve now equips many of his power trawlers like the Wind Horse with both storm drogues and Fiorentino para-anchors. Steve sizes all Fiorentino para-anchors according to the Fiorentino’s size recommendations, lending support to our theory that “smaller” may be better. ADMINISTRATOR'S NOTE: Our special thanks to the Dashews for giving us permission to attach a pdf file of their November 28, 2006 Dashew Log. If you have any questions about this article or you would like to upload a response to this website please submit your comments here. her boat. 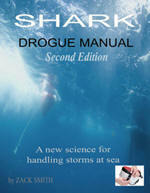 The manual not only details use of the Shark Drogue, but provides information on the pros and cons of various types of drogues. Sailors will also learn firsthand about Zack’s pioneering “Constant Rode Tension” theory which he developed after more than a decade of sea trials. In the manual, he not only explains his copyrighted theory, but offers specific formulas for putting it into use. Zack also shares specific amounts of weights for reducing slack rode and other groundbreaking tips on how to avoid shock loads on your boat. The Shark Manual can be viewed for free as a PDF and is available in a strong bound hardcopy.